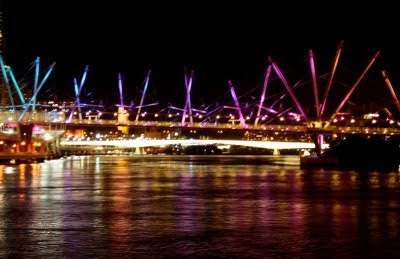 I passed the Kurilpa bridge the other night - for the first time since its opening. This rainbow display is one of the many configurations it does throughout the evening. Of course, if you're a reader of my climate change blog, you'll be pleased (as I was) to know that the energy comes from solar power. I didn't know that! I was saying to a friend the other day that I thought they could have done better with the night-lighting but now I know it's solar-powered I'll cut them some slack :-) Nice warm colours in this shot. Good one!